A 1-0 victory over Johnson-Gainesville at North DeKalb Stadium on Tuesday night propelled the No. 8 ranked Chamblee Bulldogs into the Class 5A Elite 8. The victory has the Bulldogs (14-3-2) in the Elite 8 for the first time in school history. Chamblee will host No. 6 Starr’s Mill (13-4-3) at North DeKalb Stadium on Friday, May 4 at 6:00 pm with the time to be announced. 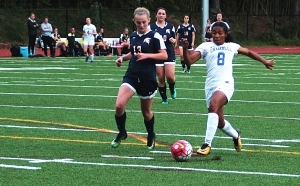 In other girls’ soccer action on Tuesday, the No. 9 ranked Dunwoody Lady Wildcats fell to No. 3 Creekview (15-3-1) on the road in penalty kicks after the two teams played to a 1-1 tie after overtime in Class 6A girls’ state tournament second round play. Druid Hills (12-7-0) dropped a 5-1 decision to Northside (14-2-0) of Columbus to fall out of the Class 4A girls’ state tournament.